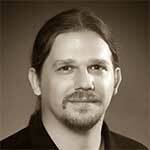 Justin enjoys working as a production manager, technical director, lighting designer, and sound designer. He is an ETCP Certified Entertainment Electrician and Rigger (Theatre), and supports the ESTA Technical Standards Program as a member of the Electrical Power Working Group. Justin holds an MFA in Technical Design and Production from the Yale School of Drama, and a B.A from The University of the Incarnate Word. At Yale he was selected by his peers to receive the Edward C. Cole Memorial Award. This award is given to the student who best exemplifies the ingenuity, creativity, craftsmanship, and dedication to the art of theater that are the hallmarks of the theater technician.